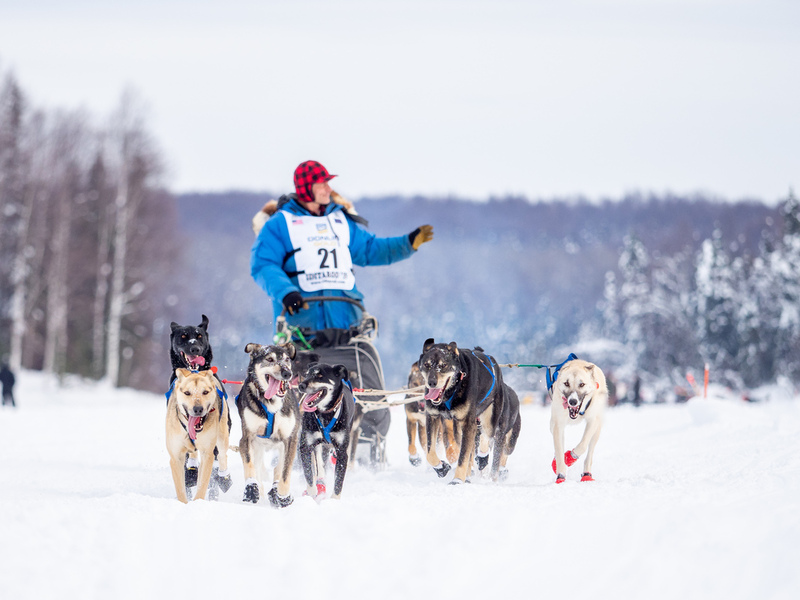 The 2019 Iditarod began on March 2 and Martin is excited to be on the trail again. https://iditarod.com/ Subscribe to the Insider and GPS tracker for in depth information. Otherwise check out Current Standings and articles on the trail as a complimentary service. https://www.ktuu.com/content/news/Iditarod-2019-Dispatches-from-the-Trail-with-DeeDee-Jonrowe-506555251.html Follow our friend and iconic musher, Deedee Jonrowe and her husband as they travel down the trail on snowmachine. She has a wealth of historical Iditarod info. Our Summer Tour Season for 2019 is now OPEN for reservations. Come and get up close and personal with the World's Most Amazing Athletes - our Alaskan huskies!!! Tour times for independent travelers begin at 2:00 on Tuesdays, Thoursdays, Fridays and Saturdays. Make your reservation TODAY and no need for payment until you arrive at the kennel. We look forward to your visit. As noted in the previous post, we are not at liberty to discuss the movie production in which Martin is involved. We can however say that this new experience has been quite exciting and educational. Folks in the area have been kind, helpful and very interested in our Iditarod endeavors. Our twenty-four traveling partners made it to Canada in great shape and barely knew they left home arriving with the same kennel arrangement and houses as home. Pregnant mom, Espresso, headed back to Big Lake when Tim Pappas came through on his way back to Big Lake. She is now happily at home with eight new puppies destined to be named after Canadian provinces. Can you say Saskatchewan? When “off set,” Martin focuses on training for Iditarod. We are so fortunate to be able to train from where we live, having a blast exploring new country. The dogs are getting new experiences running past herds of cows and deer. The terrain offers wide flat open range and long hills, thick forests and grassy meadows. With the Canadian Rockies as a backdrop, the scenery is spectacular. We currently have a little snow but not enough to put the ATV away. We are looking forward to getting out on sleds to enjoy more exploring and the soft quiet of dog power. Martin has relocated to Alberta, Canada to be part of a production of the story of TOGO and Leonhard Seppala. 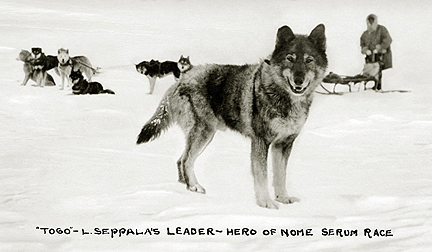 While many people are familiar with the 1925 Serum Run Story of Balto, few know about Leonhard Seppala's lead dog TOGO who navigated some of the most treacherous sections of the relay of diphtheria serum from Nenana to Nome. Willem Dafoe will play Leonhard Seppala in the movie. Martin is the mushing expert for the crew. We are excited that the story of Togo and Seppala will be told. Unfortunately, the filming is not in Alaska. 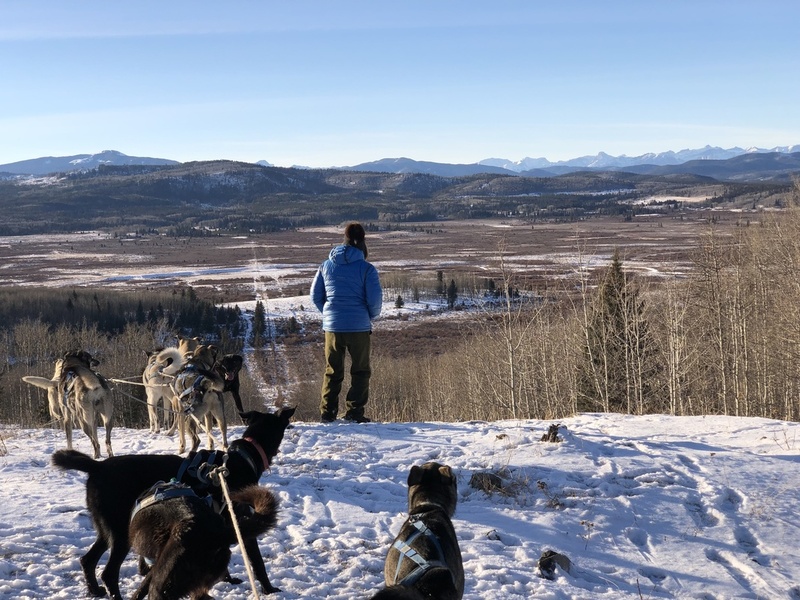 In early October, twenty four HTK Idtarod dogs will head down the Alaska Highway to Happy Trails Satellite Kennel in Alberta to train for the 2019 Iditarod. Martin fully intends to particpate in the 2019 and will be back in Alaska in early February. While we are not at liberty to discuss the movie production, we will keep you posted on the training and adventures of our Alaskan huskies in Canada. James Volek and Tim Pappas will maintain the kennel in Big Lake. It would be impossible for Martin to take on such a project without having trustworthy, skilled, and reliable help at home. Happy Trails will still be the staging area for the Alaska Mushing School in the winter season. www.alaskamushingschool.com for more information.